Style meets functionality with this CAE Ares Single Lever Vanity Faucet. The sophisticated design of this bathroom faucet makes it ideal for modern bathrooms. You’ll love the sleek, chrome finish of this one-of-a-kind bathroom fixture. An outdated bathroom can make your entire home or business feel outdated, but even simple upgrades, like new bathroom fixtures, can make a world of difference. When you want beautiful, functional vanity faucets for your bathrooms in Barbados, you want Fiberpol Inc. Our CAE Ares Vanity faucets are both beautiful and functional, and they are the perfect addition to almost any design scheme in your bathroom. 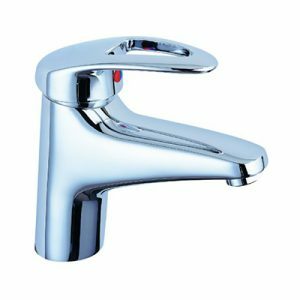 This single-handle bathroom faucet is finished with chrome that will sparkle and shine, adding a modern touch to your bathroom.